The information and broadcasting ministry has decided to lodge FIRs against the publications for producing “misleading” circulation data to fraudulently obtain its advertisements. Information and Broadcasting Minister Venkaiah Naidu said that his ministry would be lodging complaints against 277 news and current affairs publications for producing misleading circulation data to fraudulently obtain government advertisements. The announcement came after the Department of Audio Visual Publicity and Registrar of Newspapers for India submitted a report to the I&B minister following the officials carrying out spot inspections at various locations in Delhi and Lucknow. The DAVP submitted a report stating that the publications had filed false circulation data and hence, attract criminal proceedings. “There is a strong view that these publications used unfair means to obtain money meant for government ads from DAVP,” a ministerial source told this correspondent. The official added that the fudging of figures would amount to embezzlement of public money and FIRs would be lodged against owners of these publications at the concerned police stations. 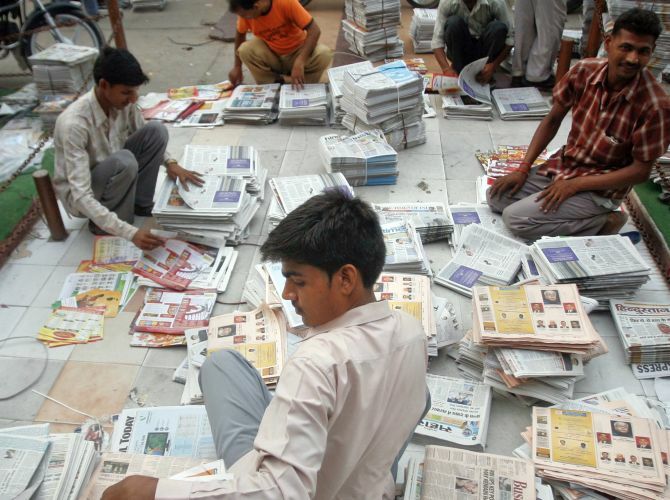 Of the 277 publications, which include English, Hindi, Urdu, Telugu, Tamil, Odiya and Bengali newspapers, officials revealed that 70 were found to be published from a single printing press. Approximately ₹1.95 crore was disbursed to these publications in 2015-16 and about ₹1.19 crore in 2016-17 to publish government ads. When contacted, ministry officials declined to reveal the names of the publications facing legal action. When asked about the FIRs, the official said that once the joint secretary in the ministry of information and broadcasting circulated the note to the state governments, the complaints would be lodged in respective local police stations. Image used is strictly for representational purposes only.